Kroger KR 24,3 +0,3 +1,4% has 4,064 stores in the country which makes them the second largest retailer. They seem to be the only chain able to give Amazon-backed Whole Foods a competition when it comes to number of stores, after Walmart. Kroger stores are predominant in Midwestern and Southern United States. Cincinnati, where Kroger is headquartered, is the city with most number of stores. 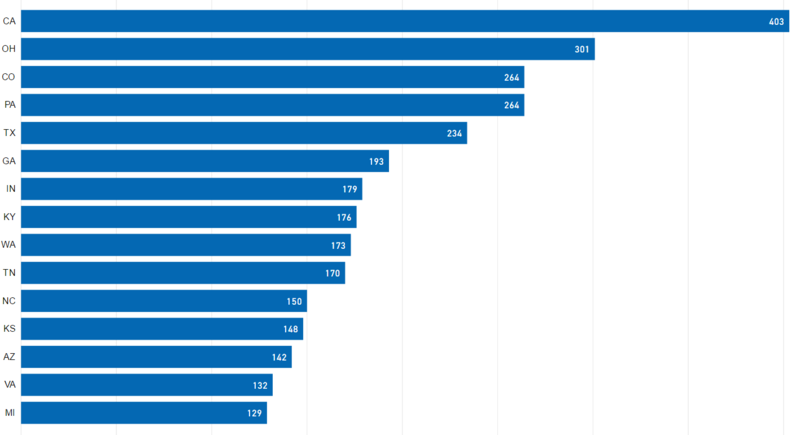 Graph above shows the top 20 states with most number of Kroger stores. Kroger has stores in 42 states, with the most number of stores in California. Delaware and District of Columbia with 4 stores each are states with least number of stores. 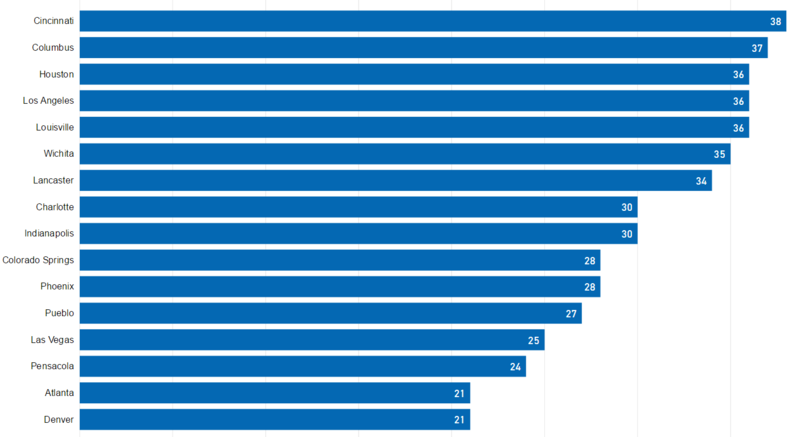 Graph above shows top 20 cities with the most number of stores. Kroger has 38 and 37 stores in Cincinnati and Columbus respectively, both cities are in Ohio which happens to be their home state as well. Kroger Stores are located only in 3 out of 9 Northeastern states. They have a low percentage of stores in highly populated states like – California, Texas, Florida, New York and Illinois compared to their competitors. Some of Kroger’s main competitors are Costco, Target, Walmart, and Whole Foods. Below are their comparison maps. Walmart has stores in all 50 states but Kroger is present in 42 states. Costco has 533 stores in the country. Costco has 24% and 5.8% of their total stores in highly populated states like California and Texas respectively. There are 1,850 Target stores in the U.S.
Target has 15.5% and 8% of their total stores in highly populated states like California and Texas respectively. Whole Foods has 476 stores in the country. Whole Foods has 18% and 7% of their total stores in highly populated states like California and Texas respectively. Amazons entry into the grocery game has forced companies to look for ways to ensure that they don’t get left behind in the competition. While Walmart has decided on tackling this by increasing their online presence, one-day deliveries, and store pick-ups. Kroger has taken another approach, partnering with Microsoft’s Azure on a technology front to help out with its cloud computing needs. While Microsoft is competing with Amazon Web Services, Kroger plans on creating digital shelves to increase their store efficiency with the help of Microsoft. This coupled with their same-day grocery delivery through self-driving cars will help boost sales. Kroger may not have as many stores like Walmart, but over the years they have acquired more than 27 chains which have helped them increase their footprint in certain states without even opening a store there. Kroger partnered with Ocado to build at least 20 grocery warehouses powered by robots, giving them an edge over both Walmart and Amazon-owned Whole Foods who are yet to look into fully automated stores.